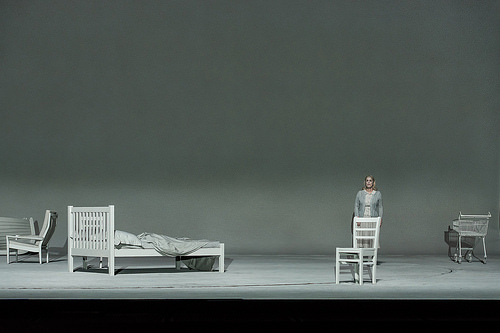 We caught Austrian composer Georg Friedrich Haas's new opera Morgen und Abend in the final performance of its premiere run at Covent Garden (28 November 2015). 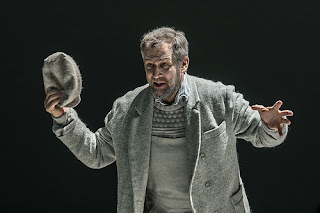 Based on a novel by Jon Fosse, Morgon og Kveld, Haas's opera sets a libretto by Fosse translated into German by Hinrich Schmidt-Henkel, with passages in English by Damion Searls. The cast included Christoph Pohl, Klaus Maria Brandauer, Helena Rasker, Sarah Wegener and Will Hartmann, directed by Graham Vick with designs by Richard Hudson, lighting by Giuseppe di Iorio and projections by 59 Productions. The opera was conducted by Michael Boder. 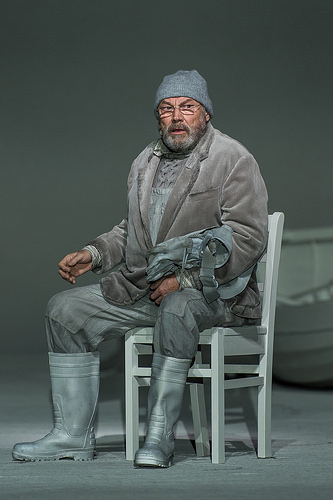 Haas's opera Morgen und Abend takes the form of a pair of monologues; though there are other characters present it is on Olai (Klaus Maria Brandauer) and his son Johannes (Christoph Pohl) that we focus. The first 40 minutes is a monologue for Olai as he waits for the birth of his song and immediately after we segue into Johannes himself who spends 50 minutes discovering that he is now dead. The man's life in between is simply implied and hinted at. Klaus Maria Brandauer is of course an actor so Olai's monologue in the first scene was a melodrama, and rather disappointingly Brandauer was amplified. Whilst Chrisoph Pohl as Olai did interact with other characters the second scene's focus was mainly on him. Jon Fosse's libretto was full of circularities and repetitions, as the characters mulled over and got used to things, both characters in a state of change. Haas's music emphasised this as he used a series of seemingly slow moving sustained chords as the fundamental basis for the opera's sound world. Within this there were lots of subtle variations, and some not so subtle such as the vivid pairs of drums answering each other in the first scene. Harmonically the work moved between diatonic chords and intense microtonal passages. It was the sort of score which would probably repay close attention and repeated listening. But sitting for 90 minutes in Covent Garden did not seem to be the best way to learn it. Some moments were truly ravishing and the ending, where Johannes friend Peter (Will Hartmann) also dead helps him to pass to the other side, was ravishing indeed. But there were longeurs too. Hass's word setting seemed to be rather stolid and anti-naturalistic which rather wearied after a time. It would be fatally easy to dismiss Haas's score as unmemorable, certainly a few people around us walked out. But for the remainder who stuck with it, the end, when if finally came, was cathartic. This is a score I would like to hear again and to ponder. Certainly, even though with a cast of just six the piece filled the auditorium and did seem built on a scale for a large opera house. The performances from the actor and the singers were stupendous. Klaus Maria Brandauer brought a nice sense of understated naturalism to Olai, but it was a shame he was amplified and it did make the monologue feel like a radio play. Rather curiously his monologue was in English, whilst the singers sang in German.Christoph Pohl as Johannes made light of the huge role and made Haas's stolid word setting seem just about right. He was well supported by Helena Rasker as his wife Erna, Sarah Wegener who played both his daughter Signe and the midwife, and Will Hartmann as his friend Peter. Graham Vick's production was understated and gave the piece space. 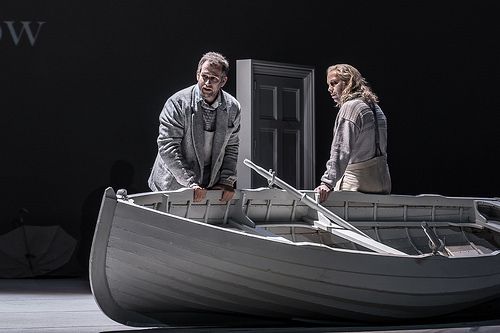 Richard Hudson's sets and costumes, and even the make-up, wee grey/beige and the bare stage had simply a few properties, a chair, a boat, bed and an umbrella which were used with telling detail. There was a revolve which went round with deceptive slowness and the boat pivoted itself as the revolve went round, before finally breaking free (a nice piece of clever stagecraft which hinted at metaphor). The English surtitles were also projected onto the rear of the stage in a manner which seemed to interpret the words as well. I didn't love Morgen und Abend but it intrigued me. Haas writes with a confident and definite voice, and his partnership with Jon Fosse has yielded a remarkable examination of the eternal verities of birth and death. After listening to it I felt as if I had spent some time inside someone else's mind, not comfortable but fascinating. The opera is being broadcast on BBC Radio 3 next Saturday (5 December 2015) which means it will be available on BBC iPlayer for 30 days after that.